The intermediate CL36 model delivers the same functionality and compact footprint as the CL26, while off ering a number of enhanced features. In addition to the larger selection of high quality instrument sounds, the CL36 employs Progressive Harmonic Imaging sound technology and damper pedal effects that further enhance tonal authenticity. This stylish model also utilises Kawai’s latest Responsive Hammer keyboard action with Ivory Touch key surfaces that absorb moisture and aid control. The built-in lesson functions and Four Hands mode allows two budding pianists to enjoy practicing the piano in pairs, making the CL36 ideally suited to young families wishing to encourage musical expression within the home. Kawai digital pianos enjoy a favourable reputation for their reliable keyboard actions, as well as their uncanny ability to recreate the distinctive touch of an acoustic grand piano. The new Responsive Hammer action utilised by the CL36 further enhances the keyboard’s structural rigidity, while adding finely textured Ivory Touch key surfaces to gently absorb moisture and assist playing control. The CL26 and CL36 reproduce the beautiful sound of Kawai’s world-renowned EX concert grand piano, with 88-key piano sampling techniques preserving the rich harmonic character of this prestigious, hand-crafted instrument in its absolute glory. From this thorough acoustic portrait, the CL36 adopts the superior Progressive Harmonic Imaging standard, allowing more accomplished pianists to play with greater feeling and emotion. With elegant curves and graceful simplicity, the stylish CL26 and CL36 represent two modern classics from Kawai’s award winning design group. 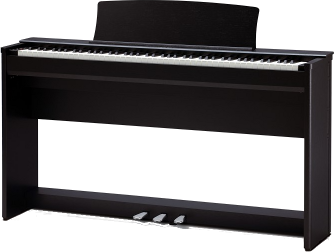 With a depth of just over 26 cm and 29 cm respectively, these ultra-compact digital pianos occupy a minimal amount of floor space, and are tailor-made for today’s urban living environments. Available in distinguished, traditional Rosewood, or sleek, sophisticated Satin Black and Satin White cabinet finishes, the versatile CL instruments blend effortlessly with surrounding interior, brightening dusky rooms with vibrant musical colour. The convenient lesson function integrated within the CL36 allows aspiring pianists to learn time-honoured standards from the popular Alfred’s Basic Piano course books. The left and right hand parts of each etude or song can be practiced separately, adjusting the tempo to perfect difficult passages, before being recorded and played back for self-evaluation. The integrated metronome is very usefull for your lessons. It offers several beats and the tempo is controlable. Absolutely anyone can make real music with Concert Magic. Simply select your favorite piece from 40 preprogrammed songs (Children’s songs, Christmas songs, American Classics, Classical selections, Special Occasions, International songs) and tap any of 88 keys with a steady rhythm and tempo. Concert Magic is an ideal method for small children to learn music, especially to develop a sense of rhythm. For those who may think it is too late to learn the keyboard, Concert Magic is a good first step to realizing a lifelong dream. With Concert Magic, your CL36 piano can be enjoyed by anyone in the family, even those who have never touched a musical instrument before. 3 pedals in a pedal board allow you simulating fine acoustic piano playing. The damper pedal allows stepless damper pedal playing.